Americans and Japanese mostly have similar opinions about what makes a good pet – in both countries, cute and cuddly creatures like cats and dogs top the list. 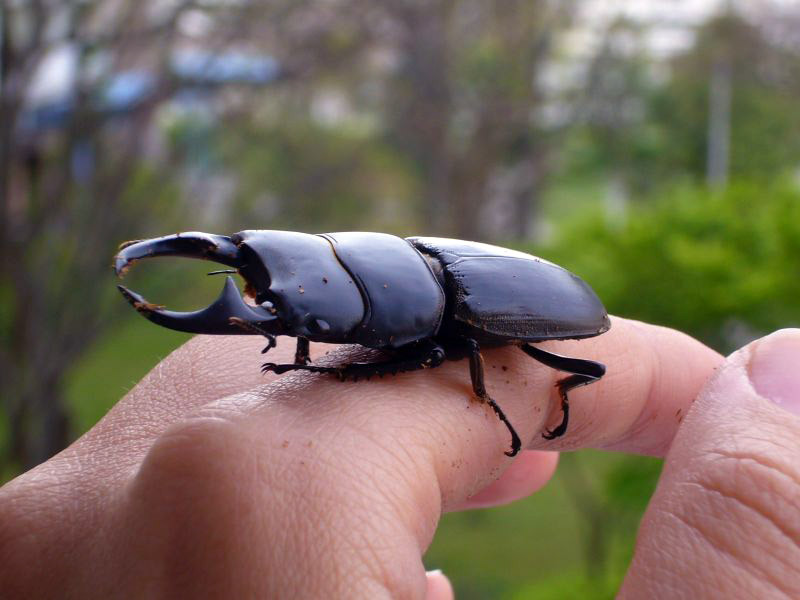 But there's one big difference: in Japan there's a long tradition of keeping pet insects, especially two kinds of very large beetles. 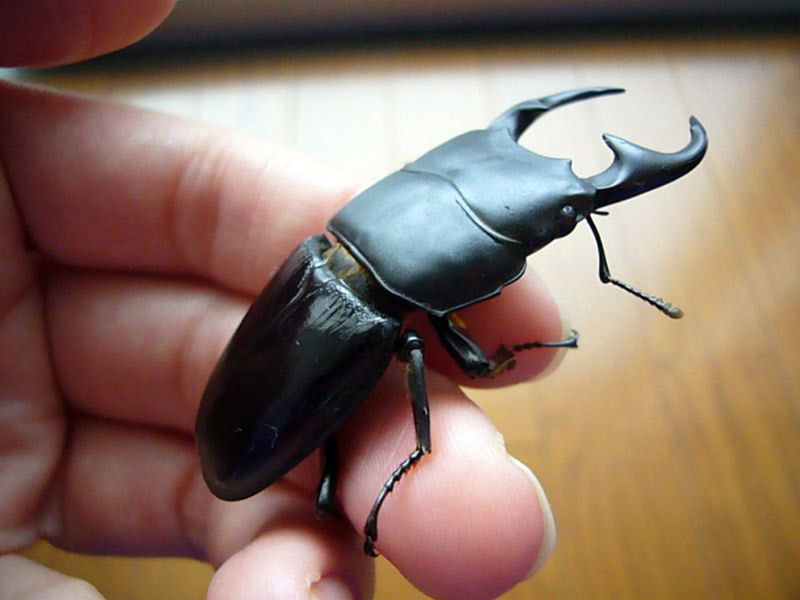 One is the kabutomushi, called Rhinoceros Beetle in English. The English name obviously comes from their single giant horn. The Japanese name means "helmet bug," apparently from the imagined resemblance to a samurai helmet. 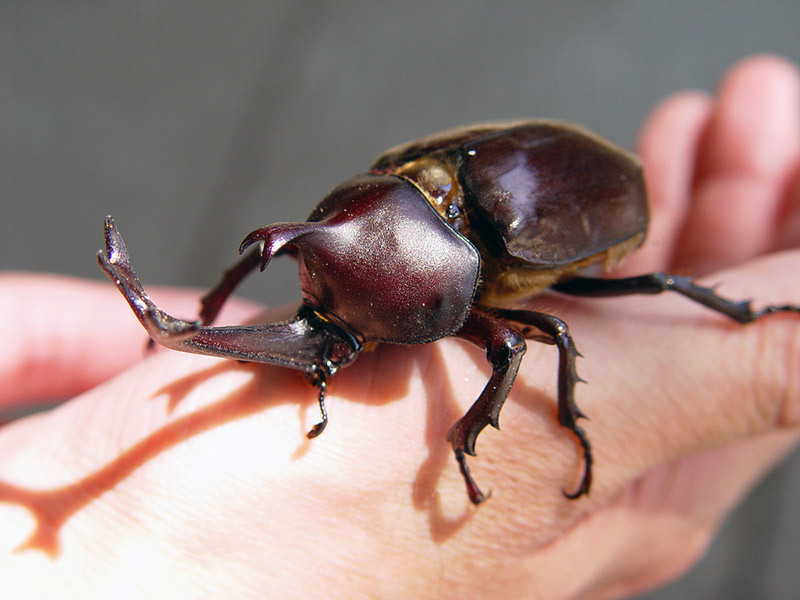 The other is the kuwagata or Stag Beetle. They're named for their double horn, which again, made English speakers think of another animal and reminded the Japanese of a type of samurai helmet. Both beetles can get to be two to three inches long and, with their big horns, you can imagine that the first small boy to stumble across them had the obvious thought: BUG FIGHT! So it's no surprise that this was the traditional way to play with pet beetles. 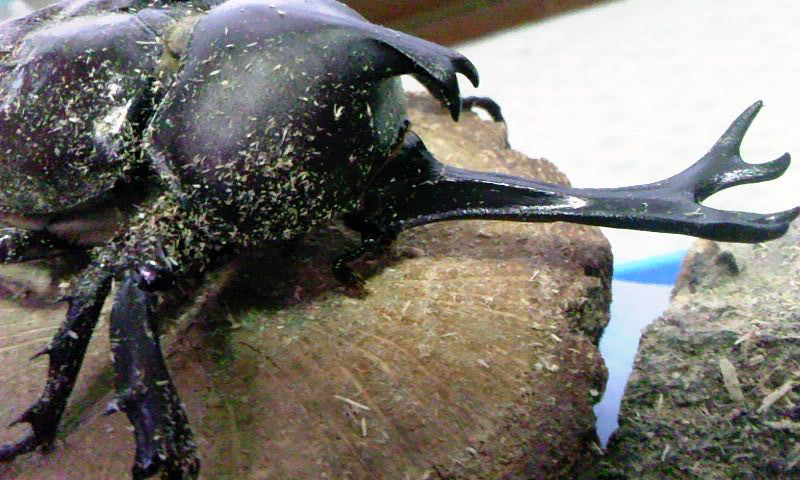 If you've ever heard of these beetles it's probably in the context of these fights, since it's one of those weird only-in-Japan things that the media loves. So when I wanted to know more about beetle-keeping, my first question, of course, was whether kids still have bug fights. 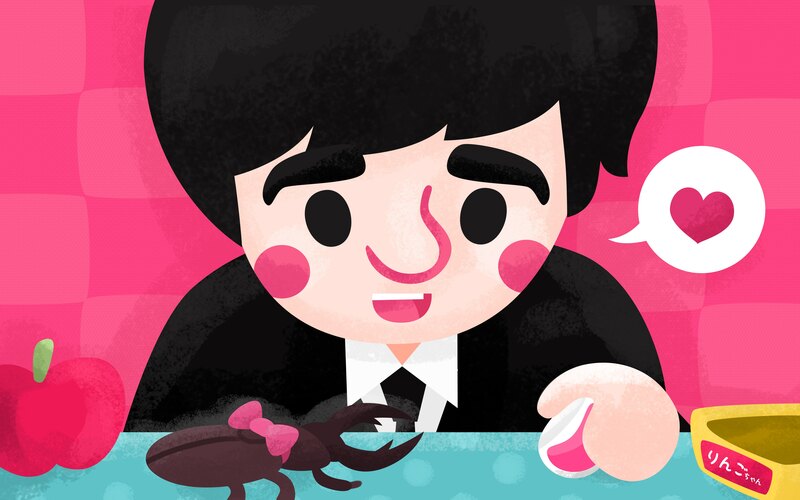 I spoke to my friend Evangela Suzuki, who has experience of both pet beetles and small boys: together with her son, she kept both kinds of beetles at her home in Ibaraki Prefecture. Despite my concern for animal welfare (and yes, bugs are animals), I was disappointed when Suzuki said she'd only seen the beetle fights on Japanese TV herself, and didn't know of any kids that fought them. "In a way it makes sense not to [battle them]. The really nice beetles are expensive and I would not think kids would want to damage them," she said. That comment introduced me to the world of modern beetle keeping which, of course, in a modern capitalist society, turns out to involve a whole lot of shopping. These beetles were traditionally caught in the wild, like an American kid might catch a firefly and put it in a jar. Nowadays, though, people who live in cities and can't go out to collect their beetles for free apparently haven't lost the urge to keep them. So a whole industry has sprung up selling beetles and supplies. 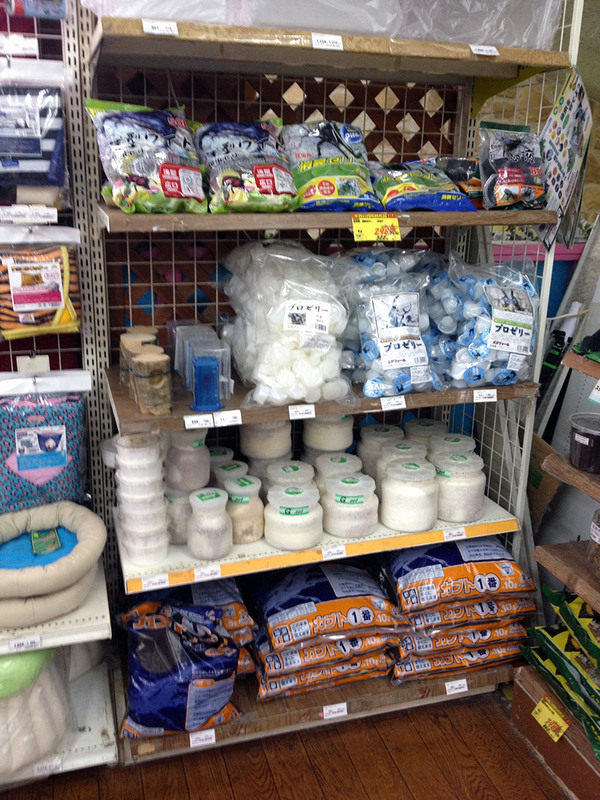 There are even pet stores dedicated entirely to them, like the one above I photographed in Tokyo. There are also a few on that website, which I presume are rarities that only a specialist would appreciate. They go for prices like ¥50,000 (500 USD) and ¥98,000 (980 USD) – and no, I am not accidentally adding extra zeros to those prices. Putting a pricey beetle like that in a fight would be like putting your brand new sports car in a demolition derby – and even a thirty dollar bug probably isn't something you're going to throw into a cage match. In fact, the more expensive beetles are geared less toward kids than to adults who are beetle otaku (of course there are beetle otaku, are you even surprised? There are so many kinds of otaku). Fortunately, for kids and cheapskates, there are other ways. Kids definitely still want these bugs – Suzuki says that her son begged for one – and stores find a way to cater to them. "Sometimes stores will have lotteries where kids can pay a few yen for a raffle ticket and try their luck in winning a more pricey beetle," she told me. 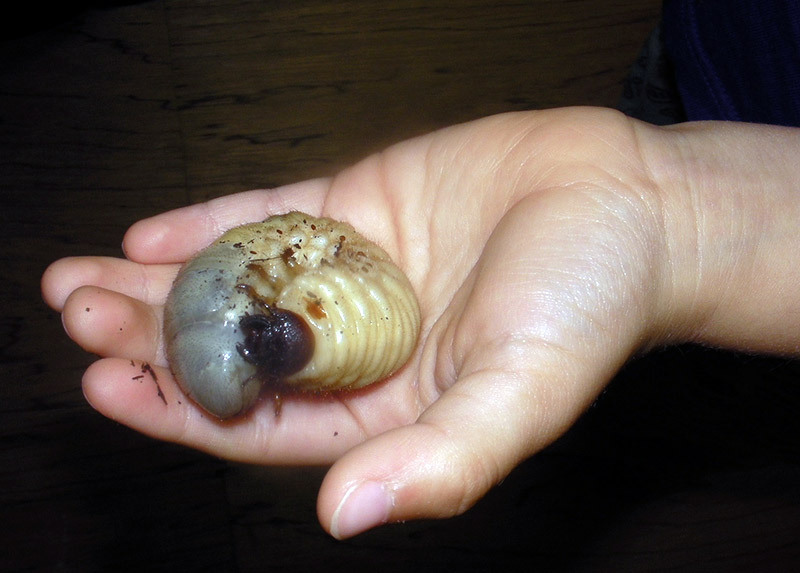 But another less expensive way is to raise them from grubs: "One pet shop a town over from us always sets up a big square pit of dirt where kids can dig for a Kabutomushi grub for only 100 yen." These bargain beetles are a good deal for the shop too because, once you own your beetle, you need your pet bug supplies – and raising from a grub means extra things to buy. 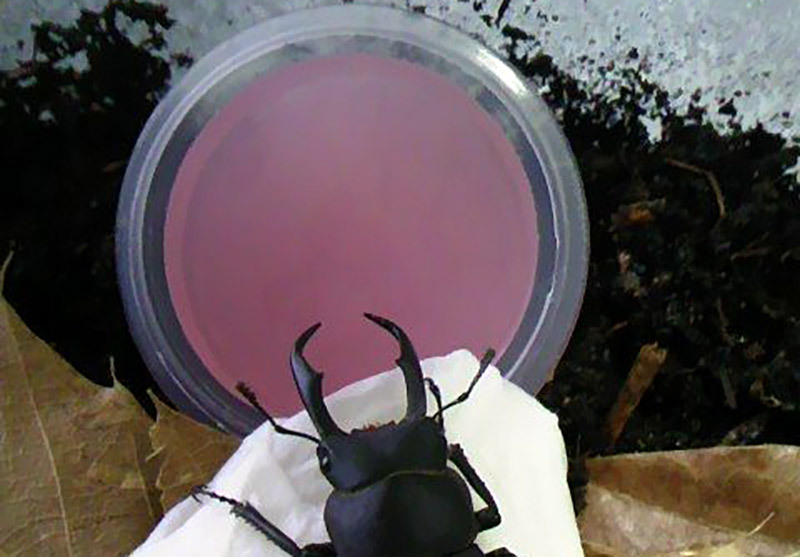 Raising bugs from babies is different from most other animals because they don't just start out as small versions of their adult selves and get bigger. They undergo a transformation to a totally different form. So the needs of the grub and the adult beetle are different – requiring, of course, shopping for different supplies at the different stages. There are all kinds of products available, including special fruit jellies sold in tiny cups to feed the adult beetles, as seen below. 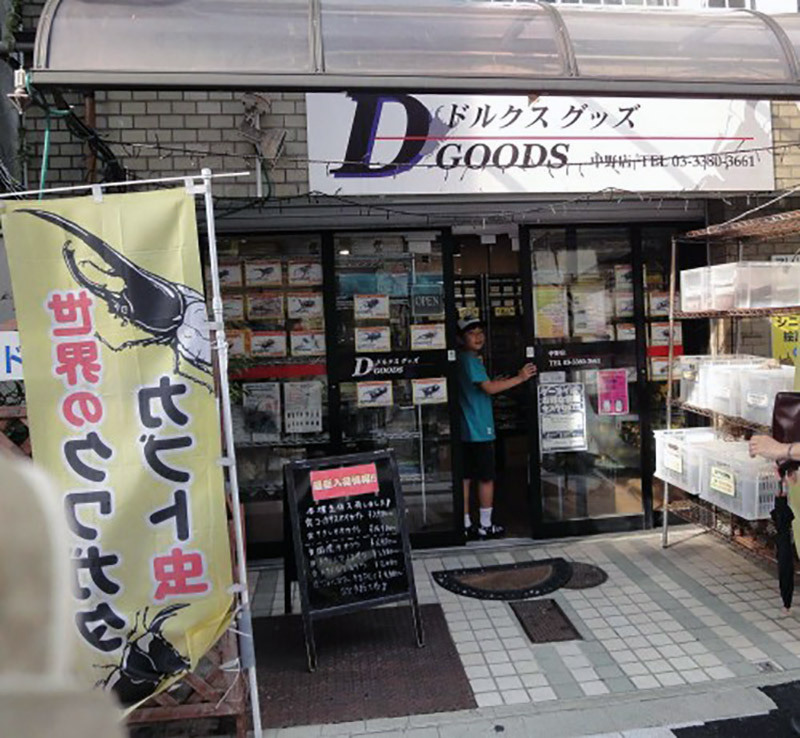 Beetles are so common as pets that even 100 yen stores sell supplies during summer. And of course now you can get them online – as I'm writing this, an Amazon Japan search returns 79 pages of results. Suzuki raised a kabutoumushi from a grub after her son, who was six at the time, had begged for one for a while. It turned out that despite his desire for a big horned beetle, the squishy little grub frightened him. So as often happens to moms, the beetle became her pet. 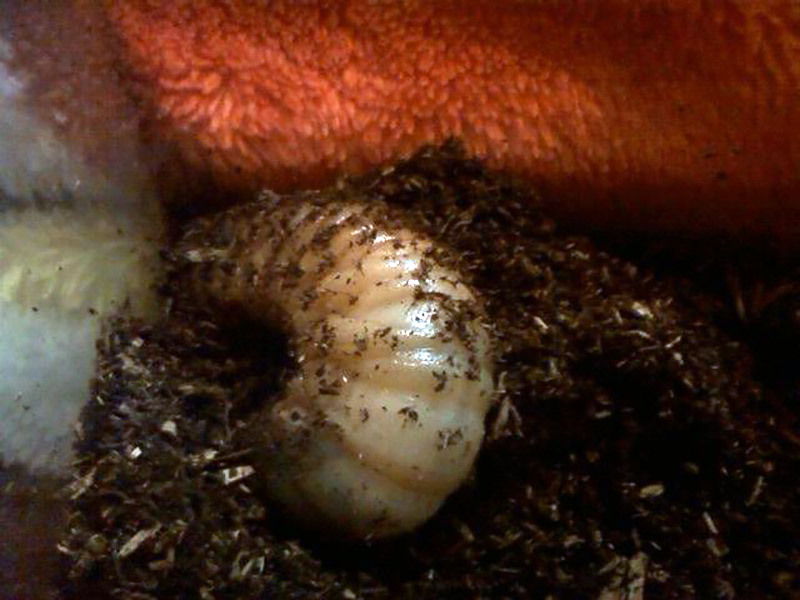 The grub needed a special peaty type of soil to both eat and dig in. Then, when it changed into an adult, the setup was fancier: "Once in beetle form, the bedding had to be changed to one of two layers, the first layer kept damp (but not too damp to cause mold or mildew) and a dry layer that allowed the beetle to climb and dig. Leaves and logs are put in not just to allow the bug to hide, but also in case it falls over it has something to grab onto to pull itself upright." It was a pretty high maintenance pet, in her opinion. The right level of humidity is important – damp but not too damp, because that causes mold and mildew. And they need to be kept clean: "They also have a tendency to spray excrement everywhere, so lots of cage cleaning. There was a special screen cloth to put over the case that kept moisture in and small flies out," she said. "Many flies are attracted to the fruit jelly and could breed if not kept out of the cage. Some people fed the beetles bananas and other fruits before the jellies became an alternative and caused the beetles to become very stinky." She named her beetle Sam and said she became very attached to him, which is a bit sad because they only live for about a year. Nine months of that is as a grub, with about three for the metamorphosis. So you only get two to three months with your adult kabutoumushi. Suzuki also kept a kuwagata, which she acquired in the more or less traditional way: she found it on the pavement outside her house. Her son finally had his dream pet, which she says had a very different personality: temperamental, in contrast to "sweet and kind" Sam. "My son is quite proud of that pissy little beetle because the one time it escaped, we found it had killed a cockroach," she said. Another difference with the kuwagata is that it can hibernate over the winter and live for several years. With some animals that hibernate it's complicated to reproduce the conditions in captivity, but apparently that may not be so hard for the average Japanese beetle owner. "Japan doesn't have central heating so it was pretty chilly in our home during winter," Suzuki said. "Our home was still warmer than the outside but I think the indoor conditions were not so much different in humidity or temperature to that of the outdoors." Nice that there's one bright side to having to spend the season huddled around the kotatsu, I guess. Of course you know that one of the grand things about Japan is that if you can't have your own pet, there are places to go to hang out with them. 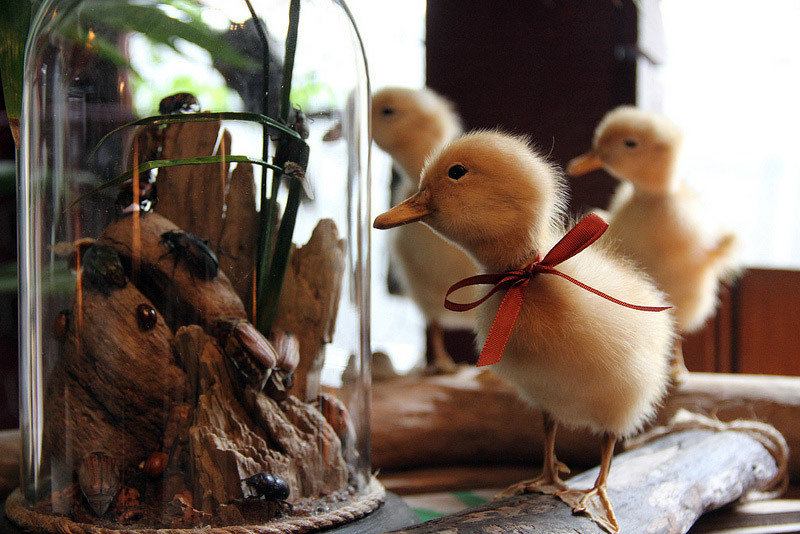 Everyone knows about cat cafes, which have even started to spring up in other countries, but there are also cafes with rabbits, various birds, reptiles, and even goats. Never fear, bug lovers. You are not left out: you can go to Mushi Mushi Land. "Mushi" means "insect" and this park has bug exhibits, bug themed rides, and the requisite slightly unnerving costumed mascot seen in the video above. There's also lodging and a restaurant, which from the photos appear to be reassuringly free of bugs. I mean, I am really very interested in insects, but there is a time and a place for everything. Closer to where most tourists are likely to be, namely Tokyo, the Tama Zoo in the western suburbs has a very large Insectarium. 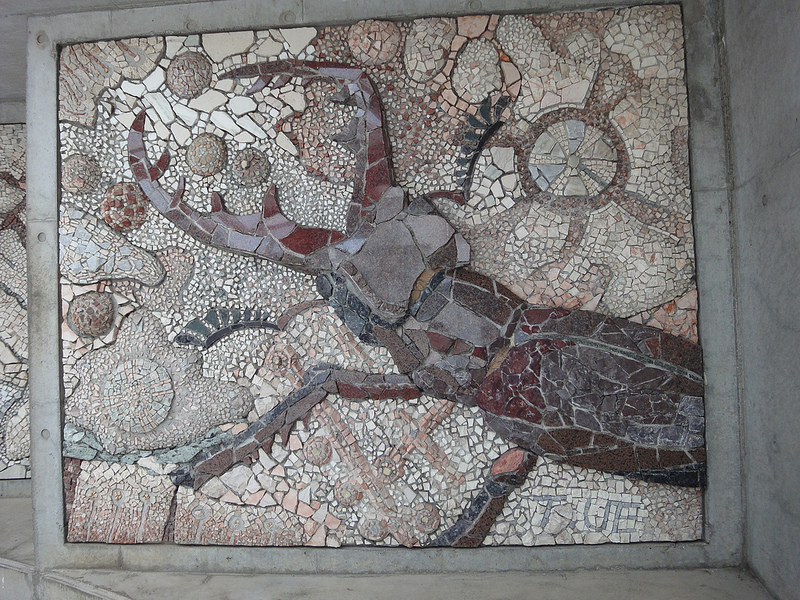 Not only does it have lots of live insects of many kinds, it's decorated with all sorts of insect art pieces, like the stag beetle mosaic above. If you're travelling with friends who aren't convinced they want to see beetles, you can send them off to the big indoor free-flight butterfly exhibit. It's perfect for those unfortunate people who haven't learned to appreciate the appeal of enormous horned insects. By the way, if you live in the US and this article has made you dream of a pet beetle, you don't have to move to Japan. We have similar native species and there is a small but enthusiastic community of people who keep pet insects. This is one site that seems to have them for sale occasionally, and there are other types of beetles for sale. The latter is also the place to go for exotic roaches – which I have been told more than once make great pets. But that's a story for another time.